Pareto efficiency occurs where at least one party benefits and nobody is made worse off. Kaldor Hicks states that a decision can be more efficient – as long as there is a net gain to society – enabling any potential losers to be compensated from the net gain. 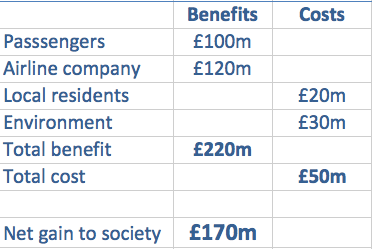 The total benefit is £220m. But, two groups lose out – local residents and the environment. To build the airport would not be Pareto efficient because although there is a net gain of £170m – two groups lose out and are worse off. However, according to the Haldor-Hicks criteria, it would be efficient to go ahead because of the net-gain and the fact that, in theory, the groups losing out could be compensated. Under Kaldor Hicks, the key principle is the idea that, in theory, people could be compensated. This compensation doesn’t actually have to occur. Whereas under Pareto efficiency, this compensation would have to occur through voluntary agreements between two parties. Kaldor-Hicks criteria may be used to judge the effectiveness of a Cost-Benefit Analysis scheme. Just because, in theory, compensation may be given to those who lose out, in practice it may not. Local residents would feel unfairly treated if the airport went ahead. Kaldor-Hicks criteria can lead to an increase in inequality and be perceived as unfair. For example, those under flight path may feel it is unfair they have been singled out to have to put up with an airport nearby. It places economic welfare and total economic utility above other moral considerations. Utilitariainism vs notions of fairness. How do you compensate “The Environment”? Or the future generations who will suffer the major deleterious effects? There are many companies that would go bankrupt if they had to actually pay for their “externalities” that they impose on society. And, since money controls policy, compensation will never happen.